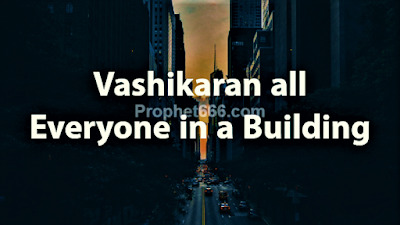 A simple Mass Vashikaran Totka, involving a small 5 words Mantra, which is said to have the power of putting all persons living in a specified locality, like a small village, street, colony, housing society, a standalone Building or any other small area in a town or city under a Vashikaran Spell of attraction has been described in this post. This simple to chant Vashikaran Mantra appears in a reliable and authentic Tantra on Akarshan Vidya and it does not takes up much time or effort to practice. However readers should keep in mind that this Vashikaran Mantra, like most others published on this site is primarily meant for giving rare and unique information about ancient Indian Paranormal Attraction Techniques, like Vashikaran, Mohini, Akarshan and Sammohan Vidya. The simple procedure of practicing this Vashikaran Mantra Experiment has been given below. 1] There is no Siddhi Sadhana for this Vashikaran Mantra and it can be actually practiced on any day at any time. 2] The Vashikaran Mantra is not dedicated to any deity and hence, there is no need to perform any special religious or Tantrik ritual before or after casting this Attraction Spell. 3] When the practitioner is visiting any of the localities mentioned in the opening paragraph and wishes to get the co-operation of all the persons present in that area, he has to pick up a few Kandad or very tiny stones, gravel or pebbles and chant the Vashikaran Mantra given below just 11 times. This simple procedure is said to transfer the energy and attraction powers of the Mantra into the Kankad. 4] Then, the practitioner has to throw the Vashikaran Mantra Infused Kankad on a Chouraha or if there is no Chouraha, then he can throw the Kandad on any central place in that specified area. 5] This simple Vashikaran Technique makes all the people present in that place amicable, friendly and co-operative. Please give your feedback, if you attempt this Attraction Spell because it could help others who would like to use it. This spell can be used for the purpose of love, marriage, business or any other financial or commercial motive. However, it will not work, if used for dangerous, harmful and illegal purposes. Many similar Vashikaran Experiments for Mass Attraction can be seen in the section on – Attraction Mantras and Love Spells. How long does the effect last.. How frequently do you have to repeat it..
Can you do it for your office.. Workplace...social club..
Is it to be renewed every day . How llong does one prayog last.. I want to do this activities in the office. But in the office small or little stone I pabble not available. You can use also use tiny mud like gravel. Kankad can be arranged from anywhere or have to be from that place. Cant say how long the effect lasts, it can be done in any of the places mentioned by you, the Kandad should be from the same place.